The Academy Cougars rolled into the Dale J. Jenkins Gymnasium on the St. John Campus to try and do what no team has this season: beat the St. John Knights, who came into the contest at 8-0. Academy eventually shook off the nerves and survived a tough match to get it done! The Cougars handed the Knights their first loss of the season in three sets 16-25, 25-23, 25-19. Academy looked to be a little off their game as they weren’t able to jump out to the quick start on offense as usual. 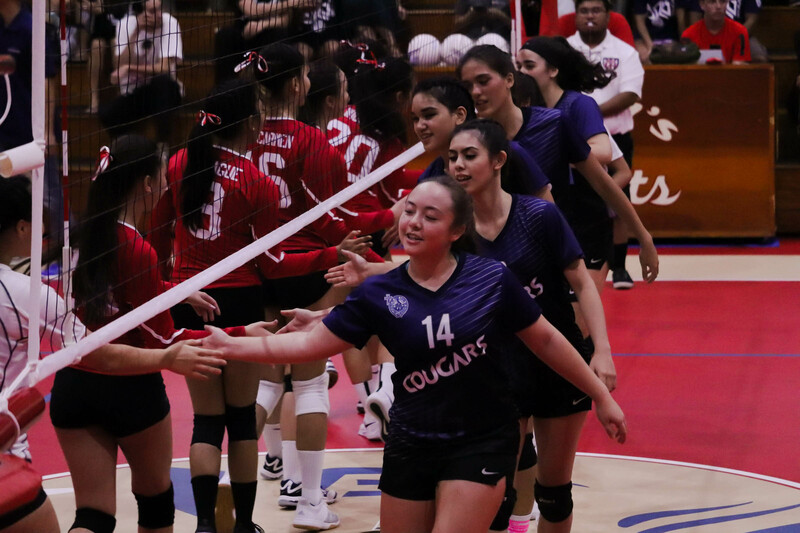 Nerves seemed to play a factor as the Cougars struggled to find a rhythm early on and found it even more difficult to produce any points. St. John’s were dominate per usual as the red and white locked down the front of the net. The duo of Angeline Del Carmen and Tylee Shepard anchored a strong defense. The Knights plugged up every open space Academy tried and made winning the first set all too easy 16-25, the final. The second set was much of the same, although Academy was able to hang a bit better. The team seemed to play more like, well, a team, which had been missing from Friday night’s loss to Tiyan. “We need to work as a team and we weren’t, so tonight we assessed out strong points and capitalized.” said outside hitter Isabella Bargfrede. Focusing on teamwork makes the dream work, for the Cougars. St. John, despite a late set rally and a rowdy home crowd, have no answer for the lively Academy offense. Cougars force a third set by edging out the Knights 25-23. The third set started with a weird feeling that momentum was shifting away from St. John, but the Cougars still had to play lights out. They did just that. Thiesen Taimanglo was superb at the nylon. The Academy stand-out blocked anything the Knights offense was throwing down to set the tone. St. John, not undefeated for a reason found a way to prevail, off the hot hand of Eli Errett. Errett unphased by the loud Cougar faithful snapped off a decent point run. Cougars, needing yet another defensive boost, get it with two back-to-back kills by Isabella Bargfrede and Larissa Halladay. The Knights suffer a communication breakdown late and it costs them…BIG! Cougars bounce back in a big way by taking down the unbeaten. St, John lose for the first time this season in 3 sets. 16-25, 25-23, and 25-19.